Terahertz radiation is typically understood to be electromagnetic radiation in the frequency range from roughly 0.1 THz to 10 THz. Such frequencies are higher than those of radio waves and microwaves, but lower than those of infrared light. As the wavelengths are in the range of 0.03 mm to 3 mm, and often below 1 mm, terahertz radiation is also sometimes called submillimeter radiation. For a long time, terahertz radiation was little used in science and technology, essentially since there were neither good terahertz sources nor suitable detectors available. Therefore, this spectral range was often called the terahertz gap. This gradually changed until in the 1990s the interest in terahertz waves grew strongly, and more and more research groups engaged in this area. The rapid advances in that field are largely due to advances in photonics, which created various powerful solutions both for generation and detection of terahertz waves. These advances have strengthened the motivation for further efforts in various areas of terahertz technology, and the fast increasing technological options also open a wide field of applications. Certain molecular gas lasers can generate terahertz radiation. (They are also called far infrared lasers.) They exploit transitions of certain molecules (e.g. of methanol) between rotational states, with which discrete frequencies in a wide range can be generated typically with output powers of a few milliwatts or some tens of milliwatts. Such gas lasers are usually optically pumped, e.g. with a CO2 laser. The conversion efficiency is very low. Microwave technology presents a number of options for high-frequency oscillators, such as Gunn diodes, Impatt diodes and resonant tunneling diodes. Some of these have been optimized long ago for emitting at particularly high frequencies up several terahertz. In that regime, however, the performance is much lower than at lower frequencies. Another way to obtain higher frequencies is harmonic generation in nonlinear electronic devices. This requires high-power pump sources and typically delivers rather low output powers. Generally, the performance of such microwave technology sources is quite moderate in terms of output power and spectral coverage. Free electron lasers as well as synchrotron light sources can be constructed which emit very high powers in the terahertz spectral regions. They are useful for various research purposes, but are very large and expensive. Therefore, they have quite limited use for general terahertz technology. 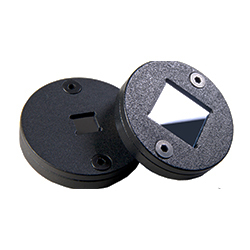 In the area of optical sampling technology, photoconductive dipole antennas have been developed which are suitable both for generation and detection of high-frequency electromagnetic signals. Miniature versions of such antennas allowed their use also in the terahertz region. Essentially, a sender antenna consists of two short metallic stripes with a small gap in between, made on a semiconductor material with a short charge carrier lifetime. A DC bias voltage is applied to the stripes, and an intense ultrashort laser pulse from a mode-locked laser focused on the region between the metallic stripes generates a short circuit for a short time. (The semiconductor gap serves as a photoconductive switch.) The fast potential change induces fast oscillations in the antenna, which in turn lead to terahertz radiation emitted in a wide range of angles. The decay is often so fast that one obtains a single-cycle source, i.e., a source emitting only about a single cycle of the electromagnetic oscillation. The emission spectrum may then roughly cover a substantial part of an octave or even more. This can be useful for spectroscopy, for example, as it allows one to cover a large frequency range without needing a tunable source. For higher output powers, devices with larger areas have been constructed with interdigitated electrodes as part of a metal–semiconductor–metal (MSM) structure. Photoconductive antennas can also be operated in a continuous-wave mode where irradiation is done with two single-frequency laser diodes (or with a single two-color laser ), having a terahertz different frequency. Particularly in that continuous-wave regime, photoconductive antennas are also called terahertz photomixers. One can use difference frequency generation of two optical waves with similar frequency to obtain terahertz radiation. Alternatively, one may have two frequency components of a broadband ultrashort pulse interacting nonlinearly. Such processes are possible not only in photomixers as discussed above, but also in various nonlinear crystal materials and essentially work like difference frequency generation for mid-infrared laser sources, for example. 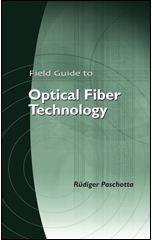 If only a single input beam (not a dual-frequency source) is used, the method is called optical rectification. This is explained in detail in the corresponding encyclopedia article. Somewhat surprisingly, optical rectification of femtosecond optical pulses, leading to terahertz wave emission, can also occur in a gas (e.g. air). Here, a plasma is generated by the superposition of an infrared beam with its second harmonic . Careful phase control of the involved waves is necessary for a high conversion efficiency. Compared with optical rectification in crystals, the emission bandwidth is typically higher, and higher pulse energies can be obtained. Quantum cascade lasers are semiconductor lasers which have originally been developed for emitting in the mid- and far-infrared spectral region. Optimization for particularly long emission wavelength has lead to emission frequencies of only a few terahertz [10, 13, 17, 19, 23], which may be tuned in some limited range. Such lasers are very compact, but need a cryogenic cooling system. Photoconductive antenna can be used not only for generation of terahertz waves (see above), but also for their detection. Essentially, a kind of pump–probe measurements can be performed, where an optical probe pulse acts on a photoconductive switch while the terahertz wave to be detected passes it. The voltage between the two electrodes of the switch will thereafter be proportional to the electric field of the terahertz wave at the time of the arrival of the probe pulse. A terahertz wave and an optical field can interact with each other when meeting in a nonlinear crystal material. This effect can be used for the detection of terahertz waves. A frequently used method is time-domain spectroscopy (see below). Bolometers can be used to detect various forms of radiation based on the heat generated upon absorption. This principle can also be applied to terahertz waves. For example, indium antimonide (InSb) bolometers can be used. Terahertz radiation finds a large and still expanding range of applications. In most cases, these utilize some of the special properties of terahertz radiation. Terahertz radiation can well penetrate many materials such as paper, plastics, textiles and foams. This has lead to imaging applications in areas like non-destructive industrial quality checks. For example, terahertz imaging has been extensively applied to Space Shuttles after the shuttle Columbia experienced a terrible accident in 2003, which was attributed to hidden damage of foam materials. Another application is in the security inspection of airplane passengers, namely the detection of weapons hidden below clothes. The attenuation of terahertz waves in media is often stronger than for microwaves and thus limits the possible depth of imaging. On the other hand, the shorter wavelengths make a higher spatial resolution possible. Terahertz radiation is difficult to transmit through cables, but can be transmitted through air. Diffraction is weaker than in the microwave region, so that collimated beams without excessive beam diameters can be formed. At various frequencies, however, molecules of air (including water vapor) strongly absorb terahertz waves. Fast data transmission is still possible at least over short distances like a couple of meters. Note that the available bandwidth and thus the potential data capacity is much larger than for microwave systems such as traditional WLAN. On the other hand, the cost of terahertz sources and detectors is still far higher than for microwave equipment. 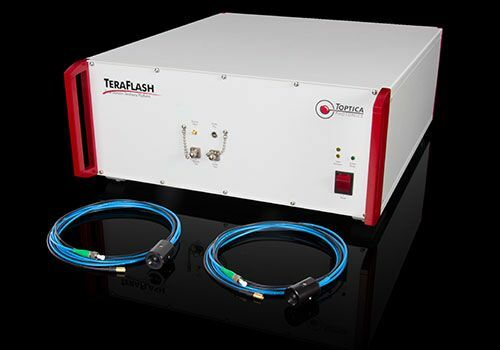 Although direct terahertz transmission through cables or fibers is extremely limited by the high losses, one can transmit optical signals through optical fibers which carry terahertz signals in the form of optical frequency differences. Some kind of photomixer can thereafter be used to generate the terahertz radiation, e.g. for radiation via an antenna. Terahertz frequencies are useful for spectroscopy in various areas such as the investigation of superconductors, plasmonic effects in conducting materials and rotational states of molecules. This is because many fundamental resonances of materials are in the terahertz frequency region. Time-domain spectroscopy is a frequently used technique in that area. This means that one records the temporal shape of a transmitted pulsed terahertz waveform, for example, by optical sampling with a variable time delay. A spectrum is then obtained numerically with a Fourier transform. Frequently used terahertz sources for such measurements are pulsed sources based on photoconductive antennas or on nonlinear frequency conversion in nonlinear crystals. In contrast to X-rays, terahertz waves have a too low photon energy for the ionization of materials. Non-ionizing radiation is much less likely to cause cancer and genetic mutations. In principle, health effects may result through other effects than ionization and genetic damage – for example, subtle influence on the behavior of cells. The situation is very similar to that with radio waves and millimeter waves. So far, there appears to be no concrete reason to expect any health effects, unless at extremely high intensity levels, as there is neither solid evidence for detrimental health effects nor a plausible mechanism causing such effects in a non-thermal intensity regime. It is hardly possible, however, to firmly exclude any possible health effects of terahertz radiation. Lacking solid data, it will for the foreseeable future be impossible to define scientifically founded exposure limits for terahertz radiation. After all, these would have to be based on known damage mechanisms. In this situation, common approaches are either to define exposure limits only based on known effects (e.g. thermal effects at high average power levels) or to define substantially lower limits according to what can easily be achieved in currently relevant applications.